Few kids are overjoyed at doing their math homework, but 10-year-old Mathew Hymel attacked his with enthusiasm last week. 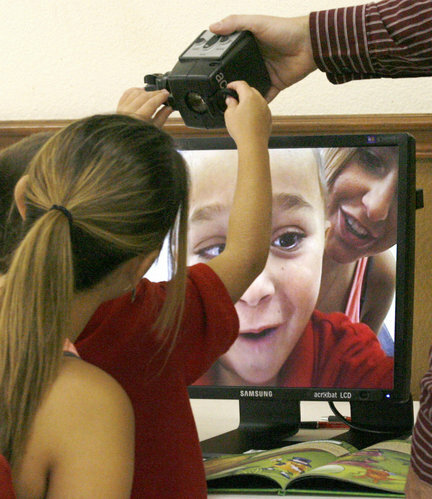 SUSAN POAG/ THE TIMES-PICAYUNE Bethany Hammack holds her son, Donivan Tassin, 7, at the Marrero Lions Club in Marrero on Tuesday, Aug. 17, as he learns to adjust the zoom feature on a Closed Circuit Television Magnifier that he was given to him by Sight Savers America, the Lions Clubs International Foundation and the Louisiana Lions. 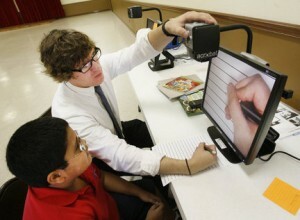 Mathew, a fourth-grader at Shirley T. Johnson/Gretna Park Elementary School, is legally blind. At school, he and other visually impaired students have access to specialized equipment, but at home, he had been relying on oversized worksheets and handheld magnifying glasses. Thanks to the Lions Club and Sight Savers America, Mathew now has his own Closed Circuit Television Magnifier (CCTV), a device able to enlarge objects up to 75 times their normal size. Mathew was one of a dozen children to receive CCTVs and other vision aids, along with training in their use, at the Marrero Lions Club last week. Ten children from Terrebonne Parish also received them. A CCTV costs between $2,000 and $3,000, putting it out of reach for many families. Mathew’s mother, Kim Bryant, said that the gift is a blessing. As her son moves up in school, homework has become more and more of a struggle. She said that his teacher, Christie Dixon, has always done her best to accommodate him. “She has gone to a lot of trouble and a lot of extra work,” she said, but the CCTV will eliminate much of the need for that, and make homework the routine chore it should be. Bryant said that her son enjoys reading, and likes going to the library to pick out a stack of books. Previously, he could only read them during free periods at school, but now he will have the simple pleasure of relaxing at home while he browses through his latest selections. Mathew’s vision problems were caused by juvenile rheumatoid arthritis. When he was 2 years old, he walked straight into a chain link fence. When his mom took him to get his eyes checked, the ophthalmologist immediately sent her to a specialist at Tulane, where he was diagnosed. He’s had six surgeries since then, with another soon to be scheduled. His vision is stable for now, but he is about to learn Braille because it is expected to worsen in adulthood. Bryant said that “he’s tough,” and has never let low vision slow him down any. He has a passion for horses, and loves to ride the biggest ones in the family’s stable. When he can’t ride horses, he can often be found on a bike, scooter or four-wheeler. SUSAN POAG/ THE TIMES-PICAYUNE Vision Rehabilitation Specialist Clint Wells helps Christofer Cardona, 10, at the Marrero Lions Club in Marrero on Tuesday, Aug. 17, as he learns to adjust the zoom feature on a Closed Circuit Television Magnifier that he was given by Sight Savers America, the Lions Clubs International Foundation and the Louisiana Lions. Sight Savers America and the Lions Club, both nonprofit service organizations, have partnered to provide vision aids and rehabilitation for underserved, visually impaired children in seven parishes: Terrebonne, Orleans, Jefferson, St. Bernard, St. Charles, Lafourche and Plaquemines. Candidates are often identified by eye doctors and teachers, and referred for an evaluation. Anyone knowing of a child with severe vision loss in one of these parishes can request more information from Sight Savers America at 877.942.2627, ext. 202, or info@sightsaversamerica.org.